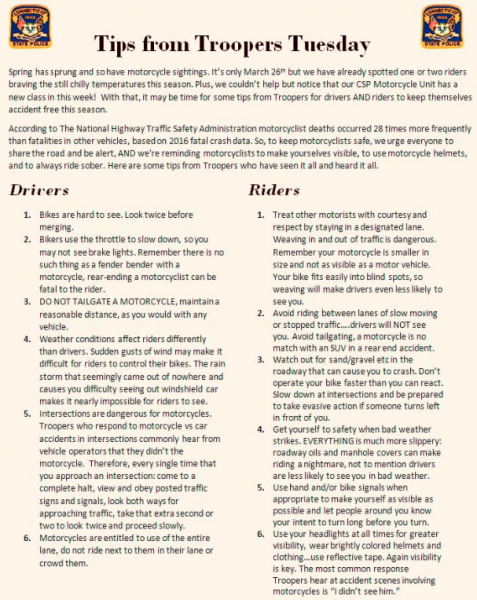 MIDDLETOWN, CT – With the arrival of spring, the Connecticut State Police are reminding drivers to watch for motorcycles as well as providing advice for motorcyclists for a safer riding season. The CSP also urged riders to be visible on the road by wearing brightly colored clothing. The CSP also promoted helmet use, noting that fatal crash data for 2016 from the National Highway Traffic Safety Administration showed that motorcyclist deaths occurred 28 times more frequently than fatalities in other vehicles. 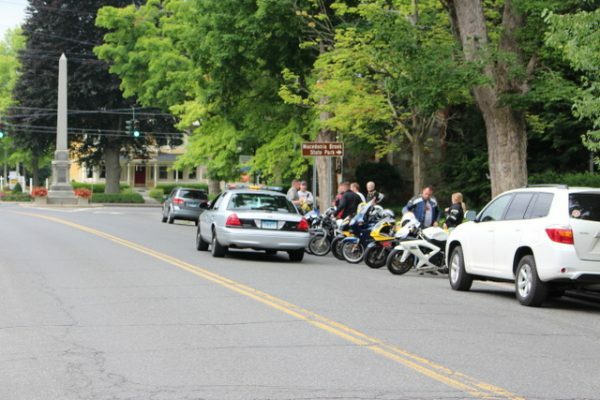 There has already been one motorcyclist fatality in Connecticut this riding season. Bryan Alexander, 48, of Tolland died a week ago when he crashed his Harley-Davidson on Route 32. The “Hartford Courant” quoted the CSP as saying Alexander was speeding while passing cars in a no-passing zone and was not wearing a helmet. One CSP tip for riders seems a tad superfluous. It advises “use your headlights at all times for greater visibility.” On new bikes, the headlight automatically comes on when the bike is started and stays on. It may be against the law to ride with the high-beam illuminated when there’s oncoming traffic, but a CSP Motorcycle Unit trooper once advised me to do just that in daytime – said he did it all the time – so as to be seen better. He said the benefit outweighs the risk of a ticket and that most troopers would likely only issue a warning if they even bothered to pull you over.